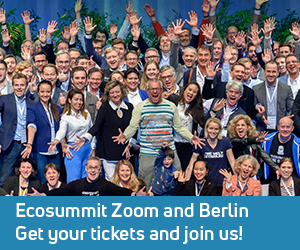 Archive for tag "Ecosummit Award"
Ecosummit Berlin 2015 was our best event so far – in terms of product quality, customer feedback and revenues. 250 super happy participants came to the Radialsystem on 19-20 May 2015 and were blown away by our unique mix of smart green people, superb conference location, fresh air on the Spree terrace, long networking breaks, tasty food, delicious wine, onsite parties with funky DJs and live act as well as a packed agenda that we ran through on time – for the first time since 2010. The secret of time keeping is collective discipline fostered by a speaker clock that is also visible to the moderator and skipping questions from the audience. During our award ceremony on 19 May 2015, we announced the 6 smart green startups winning the Ecosummit Award 2015. Ecosummit TV: Last year, we ran our startup award for the first time. 52 nominees from 9 countries participated in the Facebook and jury voting. This Ecosummit TV video documents the award ceremony of 2012 and features BlaBlaCar, Carpooling.com and MyCO2 (Facebook winners) as well as Smart Hydro Power, Heliatek and Carpooling.com (jury winners). This year, the Ecosummit Award 2013 promotes 43 nominees from 11 countries that will be judged by the 33 members of our expert jury. If you want to join the smart green startup race, hurry up, because the application deadline ends tonight at 24:00, Berlin time. 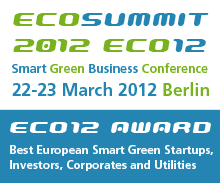 18 days to go until Ecosummit 2012 takes place on 22-23 March. We are making good progress and have important news. 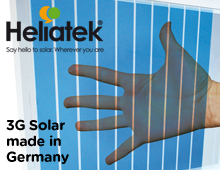 We nominated 52 smart green startups from 9 countries for the ECO12 Award. 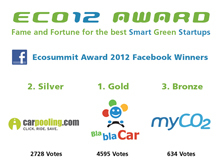 Facebook voting was officially closed on 1 March 2012 and we are happy to announce the Ecosummit Award 2012 Facebook Winners: BlaBlaCar from France wins Gold with 4.595 votes, Carpooling.com from Germany wins Silver with 2.728 votes and MyCO2 from France wins Bronze with 634 votes. We are very impressed and want to thank everybody for voting. 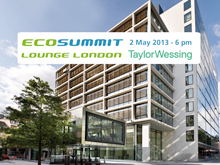 The Ecosummit Award 2012 Jury Winners sharing the prize money will be announced at the ECO12 Award Party on 22 March. The ECO12 agenda and participants are online and present many good reasons to get your ticket and join our Smart Green Innovation Festival in Berlin.